Tripawds need more than proper physical exercise to stay strong. Stimulating mental activity is also a ticket to three-legged happiness. 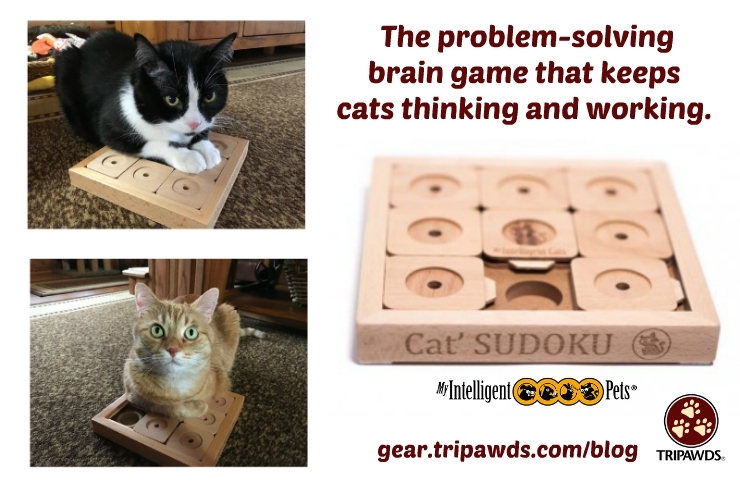 This fun “Sudoku” cat brain game puzzle by My Intelligent Pets is a great way to get there! Read on for a 15% coupon! Last month when the Meg-a-Star demonstrated her Dog Sudoku Puzzle we instantly loved with this game and contacted the manufacturer. As a huge fan of three-legged animals, the My Intelligent Pets founder happily sent us demonstration versions of the dog and cat sudoku puzzles to review. For the feline perspective on this activity, we turned to front leg amputee hero Tripawd Purrkins. Here is what he, and his four-legged brother Saxton thought of Cat Sudoku (as told by their human, Holly). 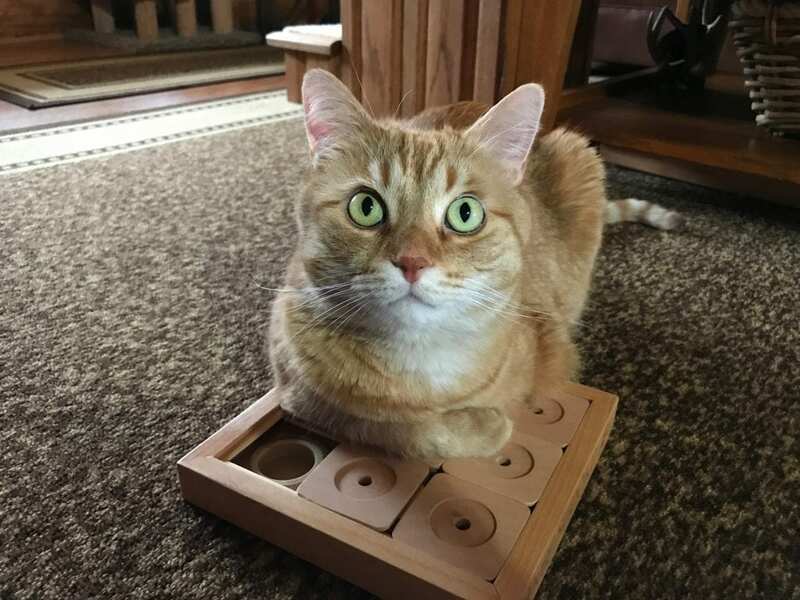 “We were so excited to try this new wood food puzzle by My Intelligent Pets! We use our puzzles as a treat puzzle because the boys eat a wet diet. Purrkins gets feline chin acne from plastic (can be common in cats) We use ceramic food bowls and have only found one non-plastic food puzzle until now. 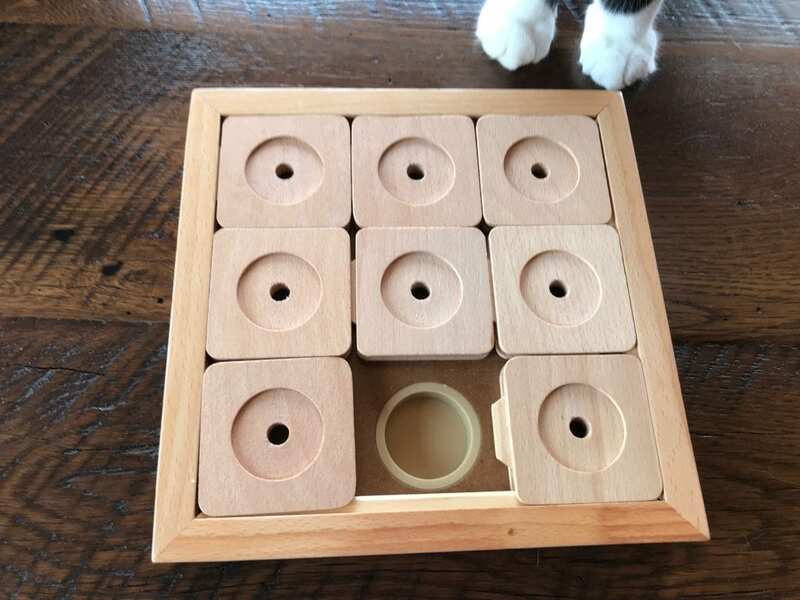 The quality of this game is the best we have seen it is WOOD with a water-based varnish safe for pets & their humans. It has stoppers on the backside, so it will not slide around on the floor or carpet. They thoroughly thought this puzzle out it’s the purrfect challenge but not simple past the first 1 or 2 hiding places. 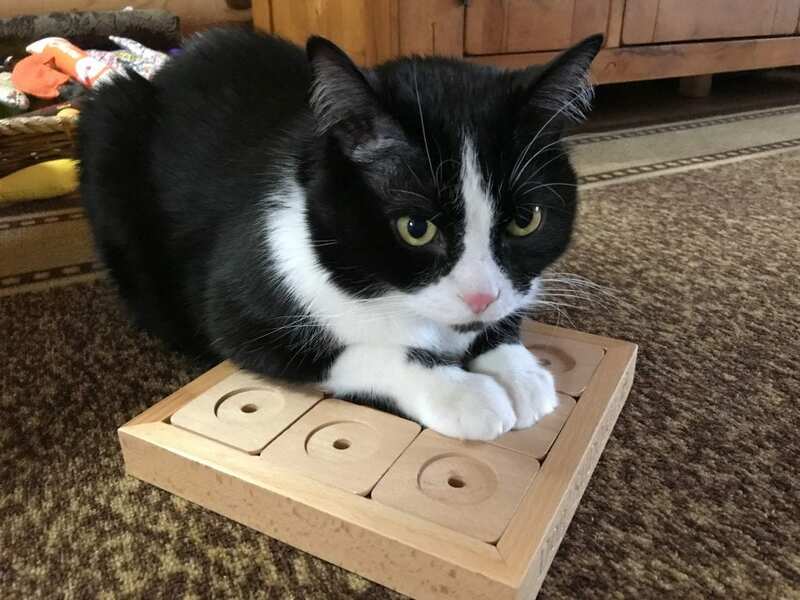 This Sudoku is nine fields Advanced level – Difficulty level 3 paws/3 mice (on the scale from 1-easy to 4-very difficult) Nine possible hiding places, and eight sliding pieces present a real challenge for experts. Saxton is the thinker if there is a will there is a way and wanted to figure it out as soon as I set it down. They both still have to think and work at it which is what we all want in a food puzzle. A mental challenge. Purrkins also wanted to try it right away after the first slide he needed to be shown how to operate it as you will see he learns quickly. Bonus Purrkins has to use he his core muscles. We used Bravo Freeze Dried Salmon under two calories a piece which we do deduct from our daily calorie allowance. The boys could smell those thru the little holes on top which was ideal to problem solve. So who is this for? ANY cat or small dog who will work for their food & needs the mental challenge who will problem solve. We could not be more impressed and boys love it! We look forward to trying more in the future. 3-4 paws up for My Intelligent Pets! Watch Saxton and Purrkins Play Cat Sudoku in real time! Think your Tripawd cat is up to the challenge? 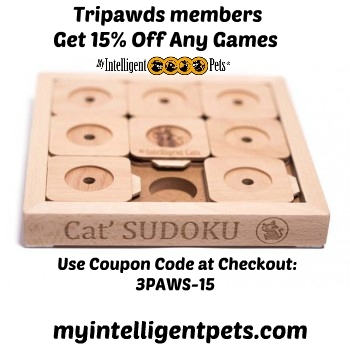 My Intelligent Pets is offering a generous Tripawds discount on any of their products! If you try one let us know what your pets think about it. Stay tuned for the canine perspective of Dog Sudoku in next week’s blog written by Wyatt Ray. If you would like your Tripawd to be considered for future product reviews, contact us for community participation requirements. What an informative product review straight from the cusomers’ perspective!! The videos say it all! And watching the different strategies used by Purrkins and Saxton were soooo mich fun to watch!!! Just love these two!! Thanks to Hilly, Pirrkins and Saxton for this great review with lots of specifics. YAY to Purrkins and Saxton taking I the challenge with their own individual style and determination! I found it so fascinating to see how Saxton and Purrkins solved the puzzles. Those cool cats do much differently than our wild boy Wyatt!